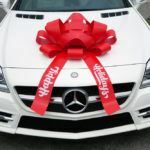 Our bows are used by companies year-round to promote their business, decorate auto dealer showrooms, launch products, create visual merchandising displays and much more. 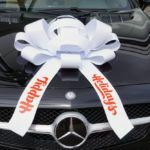 Our car bows are used to decorate dealerships, car lots, businesses and individual car surprises. Made of sturdy weatherproof materials with a no scratch magnetic back. Our giant bows come in many colors and two color combos. 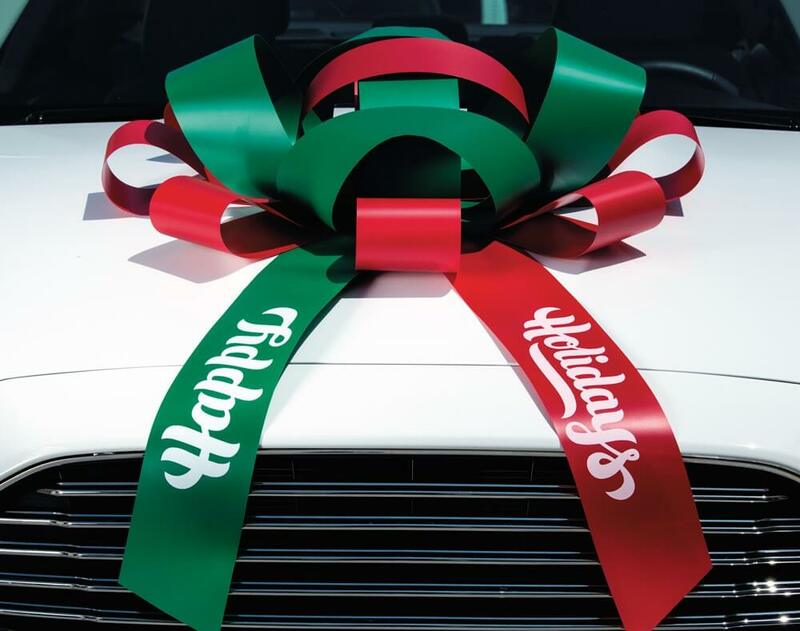 The unique happy holidays car bow is the perfect touch for a festive holiday at your dealership, to decorate for an event this holiday season. 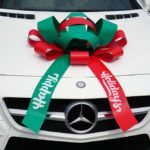 Check out our custom message bows, Merry Christmas Bows or the classic giant car bow! Are you in the market for 5 or more car bows? Check out our listing for bulk orders and received a significant discount on your order. These Bows are designed to be used indoors or outdoors. Made of high quality weather resistant, waterproof vinyl. Each Bow has a soft non-scratch magnetic base that holds the bow to the vehicle hood or roof. Each bow is packaged so it arrives to you full and ready to display. No assembly required. Available in festive colors and now with Printed Stock Bows. Dimensions: 30 inches wide with two 30 inch long x 4 1/2 long wide tails. BER Flags and Bowz, Inc is the premier supplier for car dealership supplies and giant gift bows. Our reviews speak for themselves! Customer service is our top priority and your satisfaction is guaranteed.